why has the Vatican's silence on this event been so deafening?- anyone considered that yet? Well pluton, that is an interesting way to apply numerology. Bringing the river Seine in to this, is a bit different indeed. I can see that you are pointing at the word "END", which can have a particular meaning here. 1979 in Paris or France? Not sure what you are pointing at there. I think there are several way to arrive at meaningful information, hidden in different ways here. Well, I see that the clue became actually confusing. 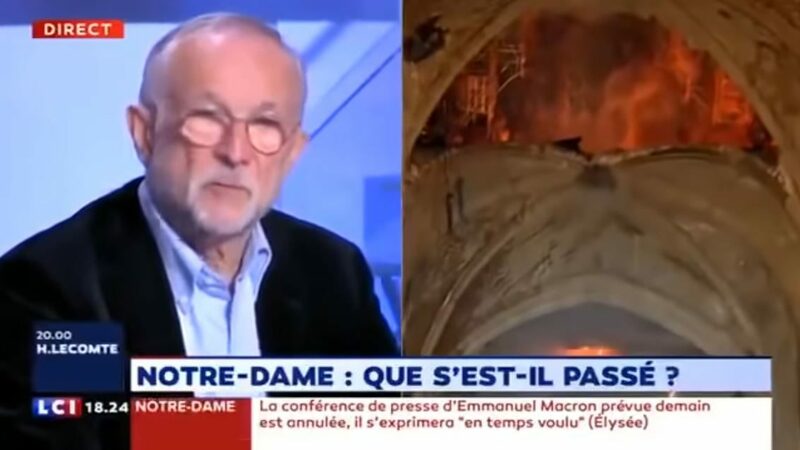 But you are right in saying that there maybe different ways to arrive at the same conclusion that would differ from the one expected by the mainstream; that is, the fire of Notre Dame was caused by an accident. But who would be the alternative mysterious agency responsible for the fire? The devil? Or something else? How does the devil think? Is it different from how that "something else" thinks? Let me explain the link between the year of 1979 and Paris, so you can find the number of days between two related events. The first year mentioned in connection with Notre Dame is 1163. "The chronicler Jean de Saint-Victor recorded in the Memorial Historiarum that the construction of Notre-Dame began between 24 March and 25 April 1163 with the laying of the cornerstone in the presence of King Louis VII and Pope Alexander III." In other words, the construction began in the 63rd year of the 12th century. Now, how do you factor 63? This question is contained in the number that represents the year 1979. Do you see the similarity between 1979 and 1997? The similarity means that the domain of connection is "A Shocking News from Paris" and not "A Major Fire in a Large City," which would connect New York and Paris through WTC and Notre Dame. That's because the last shocking news comparable to the current one coming from Paris was in 1997 when Princess Diana sustained fatal injuries during a car crash in the tunnel built under the river Seine. The point is that if you find the important word DATE messed up to read EDAT instead, the result doesn't have to be due to some accident, as we learned back in 1997 in Paris. The same goes with the fire of Notre Dame, but you need to provide some statistical evidence that the mainstream is wrong in its judgement and that's not an easy task. to see if you get something more meaningful this time? Last edited by pluton; Yesterday at 19:34. Anything meaningful? The 7 and the 9 are in there. 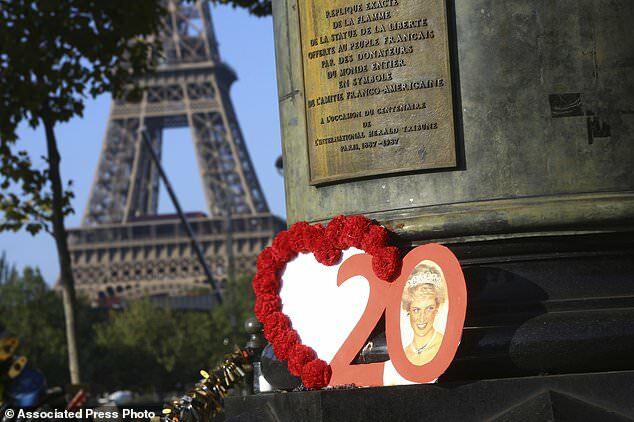 It's true that what happened in Paris with Diana, also shook up the world. I agree that she could be seen as a "symbol", and she was seen as such by a lot of people. 63 and 79/97. The centuries are left out there (11 and 19). Not sure what makes you look at the two last digits only. When thinking of the WTC and the Notre Dame, I was in the first place seeing the "two towers". The above site (see the link) gives an interesting view about "(two) towers". It is of course "easy" to get lost within any "meaning" and come up with a creative sort of confabulation. Yet, so many very important ideas and inventions came from visions (like when August Kekulé dreamed about the ouroboros and so discovered the structure of benzene). This is a very interesting field to study in any case. The two bell towers of Notre Dame did not get destroyed, thankfully. Well, I had to read through the whole thread to make sure that I am not repeating something already presented. Steve Pieczenik calls the Notre Dame fire a false flag. His opinion feels absolutely spot on to me. Pieczenik is a French Jew, and former U.S. intelligence officer with a long association with various intelligence agencies. Yes, but they, the Catholic Church never offered a penny. Not one thin dime. One of the richest organizations in the world. A Catholic treasure. But no, now corporations are contributing. Before you know it, it will be called the Loreal Notre Dame Cathedral or something equally abhorrent. Aha. The problem is that the Notre Dame towers didn't burn and collapsed, as the WTC towers did, but the link based on the "shocking news from Paris" is indeed complicated case. Moreover, the time difference between August 31, 1997 and April 15, 2019 doesn't return anything eye-catching. you establish a well-used symbol for cancellation, because things set on fire are meant to burn down. What kind of symbol would you use? Look at the upper-right corner of your computer screen. If you want to cancel the current window, you click on X. Now you apply that symbol in the name of the cathedral. If you show the above expression to someone, he or she may get curious: What does Notre times Dame mean? Such reaction is natural, because we also use X as a symbol for multiplication. But we multiply numbers and not names! The mainstream folks would call this nonsense not being able, as always, to do a simple conversion that the guys who upgraded us from The Stone Age to The Bronze Age would perform handily. They would simply count the number of letters in both the first name and the last name to do the multiplication. Since 5 x 4 = 20, you have the first part of the year in which you decide to set Notre Dame on fire - 20##. But we know that the year of the fire is 2019. Where does that second part, that 19, come from? It has to be meaningfully contained within the whole name of the cathedral for sure. But where is it? In this case a proper association would help. 1. Notre Dame <----> banana ? 2. Notre Dame <----> cabbage ? 3. Notre Dame <----> God ? Even the mainstream mind would choose Option 3. See, if the medieval folks didn't regard the existence of God as a fact, there would be no Notre Dame cathedral. That's interesting. Alpha and Omega are letters... The First and The Last.... Hmm.... Oh, look! The first and the last letters of the name got highlighted! But what does N and E mean? N + E = ? It's like in some junior high. You would be told that N and E are variables that you need to replace with some numbers to arrive at some result. Obviously so, but what numbers are supposed to replace N and E? The second argument leads toward God through the text of Revelation 13:18, and from here to the derivation of the day and the month of the fire leads a simple 17th century scientific assumption. Since there are 26 letters in the English alphabet, you turn again toward the letters of the name Notre Dame, split 26 into 2 and 6, and pick the 2nd and the 6th letter. and that's it. And no - God's mind doesn't work always the mysterious way, as the pretenders of Christian faith in the Vatican like to say. Mod note from Bill: the above post really deserves to be deleted from this thread, but I'm going to let it stand simply to show everyone how crazy it is. I completely agree Bill - - - there is a matter of allowing opinion and allowing INSANITY to run rampant. I have a limit to my tolerance of opinion - If the form is about credibility some real common sense might very be needed at this point. Yes, but they, the Catholic Church never offered a penny. Not one thin dime. One of the richest organizations in the world. A Catholic treasure. 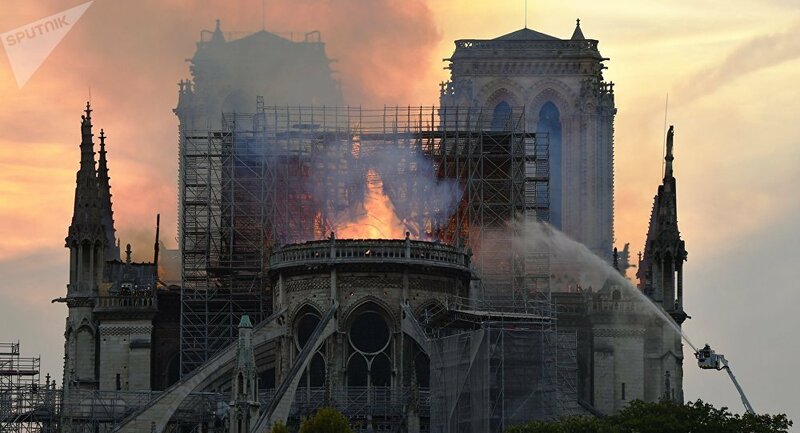 Well, it is both a Catholic/religious treasure and a French/Parisian treasure and as such, should and will be rebuilt by both. If the church was totally burnt to the ground and the government made no contribution, the Catholics in the archdiocese would build something functional for the 21st for regular masses and diocesan gatherings, nothing like the Gothic treasure it has been. Being however, that it is a national and city treasure and source of pride, that it is an important landmark and helps the city of Paris draws millions of tourists, there are a lot of other non-catholic entities that have a huge interest in seeing it restored to it's original state and that is a major financial effort. As for the "Catholic Church" paying - it will be the Archdiocese of Paris that will pay for it mainly. The Vatican does not pay for things that occur outside Rome. There might be help from all the other churches in France, and others around the world. It will take a long time to rebuild, but first, it will take some time to figure out how it is going to be rebuilt, but first quite a while to figure out how to finance it. The church is also a different entity in every nation. Some times the state owns the land, or the building, sometimes church monies are collected through taxes, not in the offering plates. Of course corporations are shouting about how they are going to donate - if they do it now, it is free publicity. Of course the church isn't making any statement about what they will be contributing because for everyone else, their donation is optional, but the church is left to cover what expenses are left over. It is ultimately their responsibility. Yes as soon as I saw the cathedral burning I immediately thought, "MACRON DID THIS". (As a way to punish the people of Paris and France for defying him with the yellow vests) New World Order hates Christianity too. And they can blame it on muslims or perhaps they just stepped aside and let the muslims do it. Did anyone notice, I didn't see many firetrucks or any big effort to stop the fire. Like Trump tweeted, why didnt they fight it from the air, like they do with forest fires? Inside job/false flag/intentional burn. Intentional demoralization of Parisians. 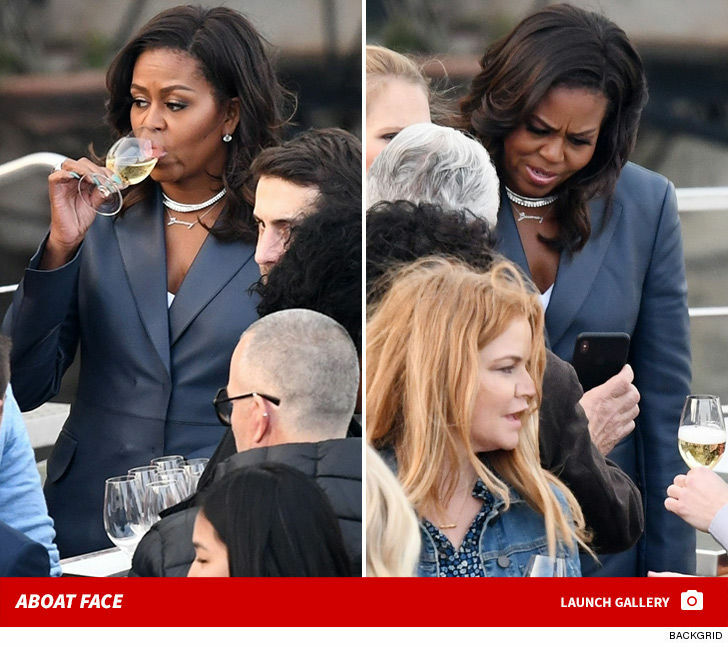 By "sheer coincidence," Michelle Obama was cruising down the Seine while Notre Dame was burning. There's already some wealthy French aristocrat calling for Notre Dame to be rebuilt as a "multicultural" monument to a "new France." This was truly an act of war, except only one side is fighting this war, openly destroying Western civilization while everyone else just sits around making faces and talking about how they feel. I'm not even French and it hurts me. Which part of the video is the gun that smokes the most? 1. "By the way, his [Macron's] popularity was 24% before the fire, and guess what - it was 24% after the fire." 2. "A day before the fire, twelve of the major apostles that were in the church, as well as important window coverings and rose colored glass windows, were taken away from the church by miracle! The New York Times called it a miracle!" Well, in the first excerpt, the speaker poses to prepare his audience for a suprise, but he then reveals that the level of popularity of president Macron remained the same after the fire - 24%. What kind of nutty argument is that? Nope, this gun is a bullet-free toy. But the second excerpt nails it: A miracle took place in a church! Even The New York Times concurred! And so, all you have to do is to answer the question who is best known to perform miracles around here and you know who the arsonist is. Well, no one else performs miracles in such a neat way, but God, right? But seriously... Is it possible that Donald Trump got something to do with the fire? See, even the POTUS is a human being prone to make mistakes here and there. 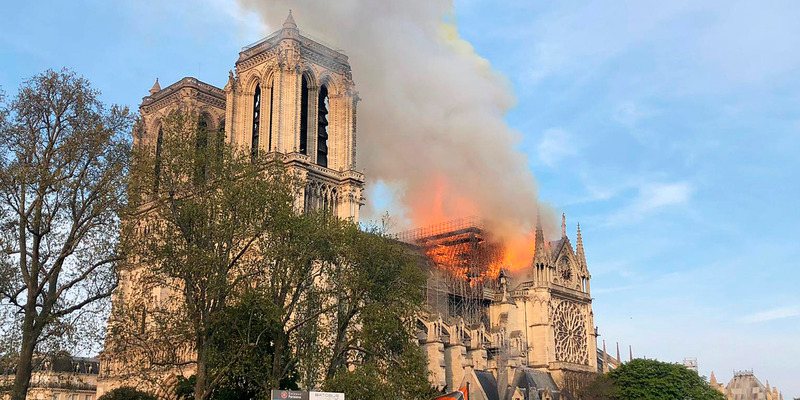 No work on the frame had begun when the fire broke out at the Notre-Dame cathedral, seriously damaging the building, said in a comment to AFP a representative of the company in charge not only of the scaffolding, but also of the renovation of the wooden frame of the spire and its cover. The company Le Bras Frères, which mounted the scaffolding around the spire of Notre-Dame de Paris, "excluded" Wednesday "any responsibility" in the fire that ravaged the building. "They exclude any responsibility," says AFP a spokesman for the company, ensuring that after "the first shock", she considered the situation with "serenity" since "the procedures were respected". According to him, the twelve employees present on the site Monday, day of the fire, were heard by the judicial police in Paris and "collaborate perfectly" with the investigators. "When you leave a building site you have to cut off all the electricity, the circuit breaker, lock the door and return the keys to the sacristy of the cathedral, which has been done and duly noted in the notebooks", assured this spokesperson. "The last one left at 5:50 pm (one hour before the outbreak of the fire, Editor's note) and the first at 5:20 pm", descending "by the two elevators that served the scaffolding," he detailed. According to him, a "mission of expertise" is in progress "to see how to dismantle the scaffolding (...) weakened by the fire", the idea being "to set up another scaffolding to dismount the first in all security". The scaffolding, he said, was under construction, to be "delivered in mid-July" and "no work on the frame had yet begun." The company Le Bras Frères, located in Jarny (Meurthe-et-Moselle), won a tender for three lots, scaffolding but also the renovation of the wooden frame of the spire and its outer cover. These last two operations had not yet begun, reminds the agency. "With really old oak like that, you'd need a lot of smaller wood to first get the fire hot enough for the ancient oak beams to burn. I am really stunned that this [the fire] has happened."